When a determined invader trespasses on his territory, Nix’s skills are put to the test as he invents several wicked tricks to chase the sorry fellow away. But when his efforts don’t go quite according to plan, it becomes clear that this intruder—and this sprite—may not be at all what they seem. This gorgeous new fairytale by acclaimed author Lena Coakley, with illustrations by rising illustration star Jaime Zollars, explores the timeless bonds of family and the joy of finding home in unexpected places. Wicked Nix is the foulest of the fairies. He's also the protector of the forest and will keep people out of it. But when a "man-people" moves into a formerly abandoned cottage, Nix must trick him until he's scared enough to leave. Nix makes his water stinky, plants thorns in his garden, and puts out his fires, but nothing is working. This "man-people" is determined to stay, but the queen will be returning soon and Nix doesn't want to disappoint her. However, meeting this "man-people" leads to an unexpected and heartbreaking revelation. 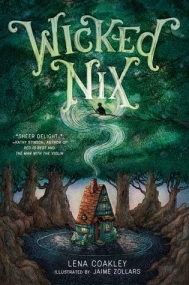 WICKED NIX is a beautifully crafted story about the wicked and deceiving ways of fairies. It is both heartwarming and heartbreaking all in one. I love Nix's character and how he is fun and innocent, but is also the "foulest of the fairies". Final Verdict: I would recommend this to fans of fantasy, folk tales and myths, and fairies.